I build Iron Man Suits, Robots, and tinker with Smart Homes. I also write books, code. My Books, Other Books, General Comments on Books! I just released a copy of the 2nd Edition of Build Your Own PHP Framework. This book has a lot more examples and the source is hosted on GitHub. You can purchase the 58 page PDF from www.phpframeworkbook.com, or on Amazon.Com for your Kindle. More To Read - You will notice this edition will be more thanTWICE the size of the original book. More Examples - Each chapter will show you working examples as well as how to use the example on the sample CMS (Content Management System) being built throughout the book. More Code - Each chapter will show you the exact code of the framework vs. snippets in v1. More Details - I’ve included a lot more detail around “Why” you do things. Bonus Material - When you purchase the book you’ll get a custom code for accessing bonus content! This entry was posted in Books, Programming on July 25, 2012 by Scott. 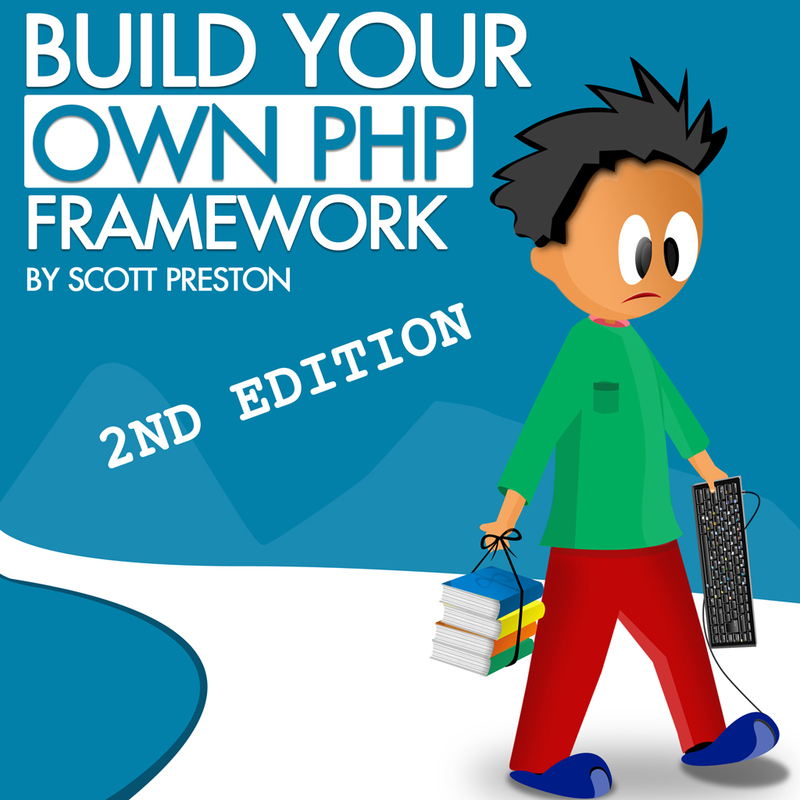 I’ve started work on the 2nd Edition of Build Your Own PHP Framework. the size of the original book. More Details – I’ve included a lot more detail around “Why” you do things. bonus content! Get Bonus Material Before ANYONE ELSE! This entry was posted in Books on June 25, 2012 by Scott. Maybe you’ve used a CMS like WordPress, Drupal, or Joomla. But what if those had too much baggage? Too much dead code? Too much un-tested code or code that’s so cumbersome to use you’re stuck building your own? I’m thinking about starting another book this summer called Build Your Own PHP CMS. Not only will I update Build Your Own PHP Framework, but I’ll describe in detail what you’ll need to do to create your own CMS from scratch. This entry was posted in Books, Frameworks, Programming on June 3, 2012 by Scott. The price is higher. Hopefully with the higher price people purchase less impulsively. Which means they think a little bit about what they are going to purchase which means they preview the book and decide yes/no. I plan on updating Build Your Own PHP Framework this summer and creating a 2nd book called Build Your Own PHP CMS. I plan on creating an update to Robotics Programming 101 and creating a 2nd book on Machine Vision maybe I’ll call it Machine Vision 101 or something similar. Big Note: If you purchase from me (via sites above) vs. Amazon.Com, I’ll get you 2nd editions for FREE. This entry was posted in Books, General on June 3, 2012 by Scott. This can be any audience, pick one that don’t annoy you or will grow tired of. You have a reach to this audience via some amount (%). If you don’t have reach, figure out your reach. These are your prospects. That % either cost you time or money or both. Pick one that minimizes each or both. This problem will be felt by a % of the audience and similar % of your reach but these numbers are not the same. Provide value (aka helping people) what can you add to or remove from someone’s life and then get paid. This solution will hit with a % of the people that have the problem that you can reach. Your sale will have a interval of time between first contact and completion, pick one that you can scale, and that falls within your time-line. The people that purchase are the end of your funnel and relative to other businesses selling the same/similar solutions to the problem, that’s your market share. The solution often takes the form of a belief, I believe X can give me MORE X, or LESS Y. See #2. This cost less and saves time to build second and sell first. If the cost to reach the customers at the top of your funnel is less than you make per sale, then you have a business, continue. This is making more money, by maximizing conversion rates and increasing the size of your funnels to achieve maximum efficiency. Measure what you want but don’t spend too much time measuring (See Heisenberg Uncertainty Principle). Trust me any book you purchase will tell you 4 of these 5 things, leaving you wanting more, and thus purchasing more books. Save yourself some time and money and know this before purchasing anything else. This entry was posted in Books, Small Business on May 30, 2012 by Scott. All, I’m going to be pulling some of my self-published books from Amazon in the next few days. It was a great experiment and I was able to sell lots of books and gained a lot of experience and received lots of nice (and a little not nice) feedback on the books. I will either revise & republish or retire and make open source the contents of the books. This entry was posted in Books on April 13, 2012 by Scott. Pre-Order now available on Amazon.com. I will walk you through building a mobile web app from scratch using real-world examples. You’ll learn about design considerations, mobile web frameworks, and HTML5 features like animation and graphics using Canvas. You’ll also learn how to customize your app for a variety of platforms, and you’ll explore testing and performance tips for your app. This entry was posted in Books, Computing, Programming on March 11, 2012 by Scott. Build Your Own PHP Framework – Book Announcement! There’s almost a hundred different PHP frameworks out there. Some are big some, are small. All of them do about 80% of what you need the way you want it, but the 20% that’s not usually takes you the most time/effort/money. This book shows you how to build your own PHP Framework using a PHP Framework template called GinPHP. Visit the website to learn more http://www.phpframeworkbook.com. This entry was posted in Books, Frameworks, Programming on June 14, 2011 by Scott. I created a short book on Motion Detection. It’s basically an example that shows you how to do motion detection with some of the APIs from Robotics Programming 101. You can purchase it directly from Amazon HERE, for just $0.99. This entry was posted in Books, Robotics on June 13, 2011 by Scott. I Created A Book Page! I decided to create a separate page for my books because I’ve started thinking about expanding the kinds of books I’m writing to include more than just books about robotics. Currently the books you will find on this page are just my robotics books, which have more detail at my Scott’sBots website, in the near future I’ll have a few more. This entry was posted in Books, General, Robotics on June 6, 2011 by Scott. ©2004-2019 Scott Preston . All Rights Reserved.